Change is the key to reconciliation. But resistance and rigidity pollute the emotional climate of fragmented families. People find countless reasons not to change. A father asks, "Why should I speak to my daughter when she ignores my most cherished values?" A man insists that he can never forgive his brother's insults. A woman cannot imagine how she could reconcile with her brother after he neglected their dying mother. In the face of such provocations, how can a fragmented family be restored to wholeness? Will the hurt and the anger ever be overcome? How can they begin to move toward forgiveness and healing? These are legitimate questions, and here is my answer: growth, development, and change are synonymous. There is no growth without change. The alternative to growth is stagnation and rigidity. Estrangements tend to sustain stagnation and rigidity. Efforts to resolve conflict, whether or not they succeed in achieving reconciliation, will promote growth and maturity. Here are some suggestions for seeking reconciliation with a person who is estranged from you. I will use readers' input to modify and amplify these ideas. Identify your goals but be ready to modify them. One goal is to resolve the conflict and restore a connection with the estranged person. But don't assume that this is the only goal. Other goals may be just as important and just as useful for your own wellbeing. For many people, understanding and resolving a family conflict takes a long time; for some it takes a lifetime. Don't expect quick solutions. Recognize that estrangement may have positive value. Use the estrangement as an incentive to expand your knowledge of your family. Rather than preserving anger or anguish, focus on re-directing some of your energy to the task of clarifying your own role as a family member. Your new insights may or may not lead to reconciliation. In either case, you will become a wiser, more complete person. If the other person won't reciprocate, it doesn't mean you failed. In many families, only one person wants to resolve the conflict. The others are resistant, indifferent, or simply not ready. If this is the situation in your family, you can still benefit from the new understanding that will come from your efforts. Trying and failing is better than not trying at all. If you intend to evoke guilt, demand an apology, or change the other person's behavior, your efforts will probably be futile. If you cannot give up your fantasies of a "perfect" relationship, or if you continue to expect the other person to "give in," your efforts will fail. Be aware of those relationships in which you feel dependent, excessively close, or overly demanding. Try to back up and reduce the intensity of your feelings. We often get into ruts and our reactions become repetitive and rigid. Consider alternative ways to behave in situations where you have always done or said the same thing. Accept less than perfect solutions. When family members become estranged, there is usually a long history of bad feelings that led to the cutoff. If and when reconciliation occurs, remnants of the past will cling to the restored relationship. Don't expect simple or ideal solutions. Working to resolve an estrangement can be exhausting and frustrating. Your willingness to begin the task is a sign of strength. Persisting in the face of resistance is another positive sign. Identify your emotional assets and nurture them. They will serve as vital ingredients in the process of reconciling with an estranged relative. Acknowledge the other person's right to be different. Families are infinitely complex and each individual is unique. The other person is not required to be a mirror image of you. Focus on the positive ways he or she is different from you and work at respecting those differences. Severed family connections are a consequence of significant disagreements over important issues. As you work toward repairing the damage, be aware that some of the friction will remain. Learn to accept the reality of ongoing disagreement as part of the process. Try to achieve a more balanced pattern of closeness and distance. Conflicts erupt when some family members become excessively involved in another person's life, or when one person is disparaging or indifferent to the other's needs. Be aware of those tendencies that may be stirring up resentment in your family. Recognize estrangement as one aspect of family life. Many families experience a recurring pattern of alienation and reconciliation. One branch of the family may be relatively calm and peaceful, while another is mired in bitter conflict. Try to perceive these patterns as alternating rhythms in the ongoing life of the family. Pay attention to the intensity of your feelings and recognize when you are off balance. Notice which of these strategies are most difficult for you to accept. Consider why they are so difficult. The answer may lead you to the crux of your resistance. To guide your efforts, consult a mental health professional who is a family systems specialist. There is no good substitute for skilled professional help. 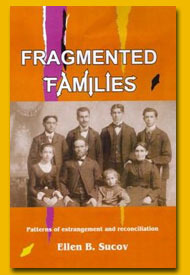 FRAGMENTED FAMILIES contains a spectrum of suggestions for exploring and repairing an alienated family. See especially Chapters 9 and 10.